Unless you’re a doe-eyed debutante in the travel industry, chances are you’re well familiar with GDS and probably use one several times a day. The Global Distribution System (GDS) is a vital cog in the travel industry machine, but why is it so important to travel management companies and what does the future hold? What is a GDS exactly? A GDS is best explained as a network that provides travel agents and TMCs with access to travel data. This data encompasses flight and travel information, car rental, hotel reservation and inventory, booking options and prices for every stage of the traveller’s itinerary. Part price comparison tool, part itinerary planner, GDS furnishes travel managers with all the data needed to provide the traveller with the best travel experience for the most competitive price. Defined another way, the GDS consolidates the disparate sectors of the booking process (flights, hotels, and ground travel) in one platform, giving travel managers easy access to scheduling in real time. Why is the GDS so important to TMCs and Travel Agents? To understand why the GDS fulfils such an integral role in the travel industry, all you really need to do is consider the alternative for a second. The pre-GDS world was a laborious one for travel managers; a ticketing request would come in, prompting the travel manager to reach for a large lazy Susan (like the ones used by short order cooks) containing indexed cards, each relating to a single airline flight. After spinning the lazy Susan and hopefully finding the right flight card, (if not, start again) our intrepid travel manager would mark the card to confirm a seat on the flight had been booked, manually write out a ticket, conclude the phone call and start again. The average time per booking using this process? A hair-rending 90 mins. Fortunately, for both the sanity of mid-twentieth century travel managers and the future of air travel as we know it, collaborative efforts between IBM and American Airlines yielded the first GDS in 1961. Known as SABRE, the new tool was handling 7,500 reservations an hour and connected 1,500 terminals across the US and Canada by 1965. Modern GDS systems produced by SABRE, Amadeus, and Travelport still owe much to their radical grandfather the SABRE system, but go much further than their brylcreemed sixties creators could have dreamed. Not only do modern GDS systems allow travel managers to search for everything from flight information to rail timetables and book reservations in seconds, they’re also invaluable for travel managers in getting the best deal for their clients. Targeted promotional messaging through the GDS itself alerts travel managers to the best packages, reduced fares and special offers—without the hours of research this would entail if done manually. In an industry where so much of a TMC’s competitiveness relies on their ability to get travellers the best deal, the importance of that information being instantly accessible can hardly be overstated. What does the future hold for GDS? When IATA’s New Distribution Capability (NDC) was proposed back in 2012, many industry heads feared for the future of GDS. The rationale being that the direct TMC to Airline relationship proposed by the NDC would render the GDS obsolete. The sheer complexity of setting up and maintaining a direct connection between travel agents and airlines has put many industry players off. Indeed, at the time of writing, NDC adoption still stands at around 10% of IATA members, excluding most of the world’s budget airlines. With so few TMCs willing to undergo the disruption and distraction a complete switch to a direct connection with airlines would involve, it’s become clear that the industry needs aggregators capable of sourcing and displaying complex data. Step forward the humble GDS. Many experts now think that further adoption of the NDC will provide more opportunities for GDSs as data requirements and online distribution only become more intricate. At last year’s Flight Global/T2RL, the panel consensus was: ‘developments with NDC and online distribution, are going to make the landscape more complex’, rather than less so. Perhaps off the back of this, there is a growing feeling in the business travel community that the potential benefits for traveller experience and industry innovation make NDC adoption a potential game-changer for both the GDS and TMCs. For more on which, download our guide to becoming NDC ready. The GDS is the travel industry’s “middleman”—as a result, they’re always most likely to be squeezed by innovation and the first to feel the pinch in lean times. Despite this, the GDS remains a bulwark of the travel industry: to take the disparate data needed and display it correctly requires serious computing power, which GDSs remain the best equipped to provide. The GDS has been buffeted by recent controversies such as IAG’s decision to levy a “GDS surcharge” on traffic coming from non-NDC bookings. However, the travel industry appears to be waking up to the idea that although change is needed to bring travel booking processes up to the standard of other sectors such as retail, any change is best implemented with the help of the GDS. Industry-scale change is rarely plain sailing, but it’s worth remembering that the GDS has survived previous innovations such as the widespread introduction of the internet, the rise of mobile and the advent of airline ancillary services relatively unscathed. While it’s possible the role of the GDS may change, perhaps to a direct corporate booking tool rather than exclusively serving TMCs, it’s unlikely that the GDS is going to fade into obscurity anytime soon. What’s far more likely is it’ll continue to develop with the same ingenuity that saw the first GDS evolve from the lazy Susan. 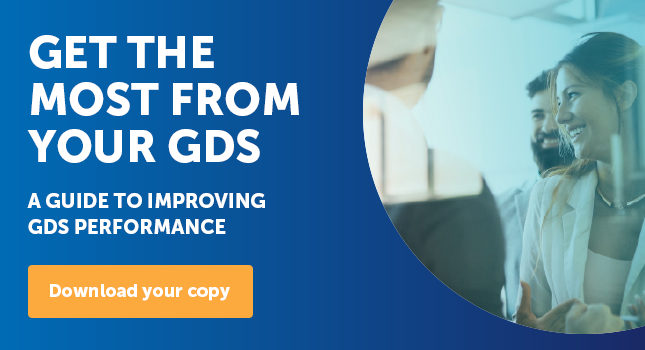 To learn more about the GDS's past, present and future; as well as how to get the most out of yours, download our new ebook.